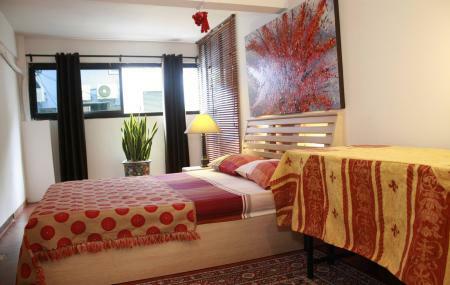 While tripping Thungmahamek you must consider booking an elegant apartment for yourself in Sanctuary House Bangkok where you would be promised to enjoy a comfortable stay. In its newly renovated spacious, studios all the rooms are beautifully furnished in a contemporary style of architecture. Its spacious non-smoking rooms are well-appointed with Luxury beds, Antique furniture, Television, Free internet, Dressing table, A small kitchen with all necessary utilities, Attached bathroom and all the amenities that are needed to enjoy a relaxing holiday. While spending some hours in the rooftop garden of Sanctuary House Bangkok, you would be mesmerised by the scenic view of the city and its surroundings. The Place is truly amazing! We stayed here two times already, in two different Apartments and we very much enjoyed both places. The Location of the buildings is great, very quiet yet central and you have everything you need literally just around the corner. The apartment themselves are super clean and comfortable. The Host is also very reliable and helpful. We would always recommend this place and hope to come back soon! Spent 2 nights here and would recommend for others. The apartment is light and comfortable and the check in instructions were extremely clear. The location is great - close to excellent restaurants, bars and shopping but also on a quiet side street. Only thing to be aware of are the stairs...there are many! Safe and awesome place to stay. Close to everything worth visiting in bangkok.